The specimen is calcite from the Challenger Mine in Mexico. The first image was taken under a short wave ultraviolet light. There is a blue-white fluorescence to the specimen. An interesting note to this mineral is that, due to its exposure to short wave ultraviolet light, it will phosphoresce for a short while after the lights are turned off. The second image below was taken under long wave ultraviolet light. 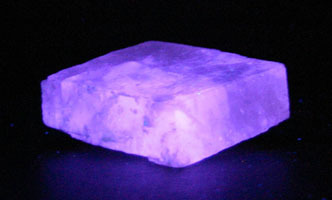 It has a light pink fluorescence under long wave light. For other images of this mineral, go back to the main fluorescent page and click on the view specimen material from Mexico link.